The architect of Ballyragget Church, William Deane Butler, was responsible for quite a few churches in the Diocese of Ossory. He also designed the Cathedral and the Diocesan College. An unusual exterior that appears to be unfinished, masks an interior that changes from a severe stone arcades between the nave and aisles to more elaborate Gothick plaster work on the vaulted ceiling. the Crucifixion. All the sculpture will be highly relieved, and the cornices, caps, &c., will be richly carved. The tabernacle will be of brass, gilt, engraved, and beaten. The altar measures on top 10 ft. by 2 ft.
4 in., and from upper step to marble top 3 ft.
1 ft. beyond face of reredos. 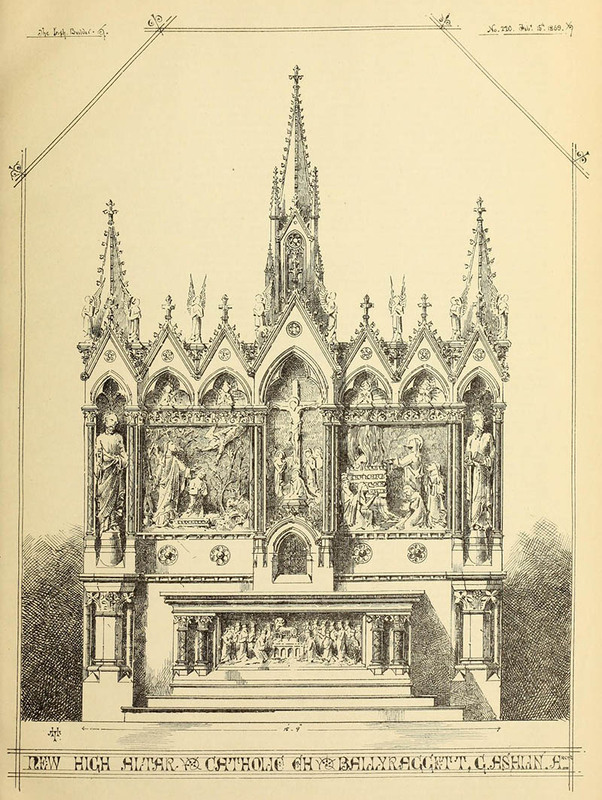 We understand that two side altars are also to be erected in this church at the east end of aisles, also from Mr. Ashlin’s design, under whose direction the recent improvements to this church have been carried out. These alterations and improvements consisted mainly of a new ceiling to nave and aisles, groined in plaster, with molded ribs, bosses, &c., and new flooring, tiling, and open benches. The contractor for the works was Mr. Murphy, of Waterford ; but Mr. Bourke, of Gloucester-street, executed the plastering.” The Irish Builder, February 15 1869.